One week and four pages complete! I just got back from my daily mailbox check. I opened my mailbox and lo and behold there was a key to one of the big boxes, meaning I had a parcel. My heart soared!! I opened it and pulled out a priority envelope and my heart was beating faster and faster. The envelope felt a little light, so I flipped it over to check the sender. It was from Gloriana Threads. Okay, tell me this. How on earth can I be disappoined in getting a parcel from Gloriana??? Truthfully, I'm not. And the new colours are to die for, the Antique Black is AWESOME. 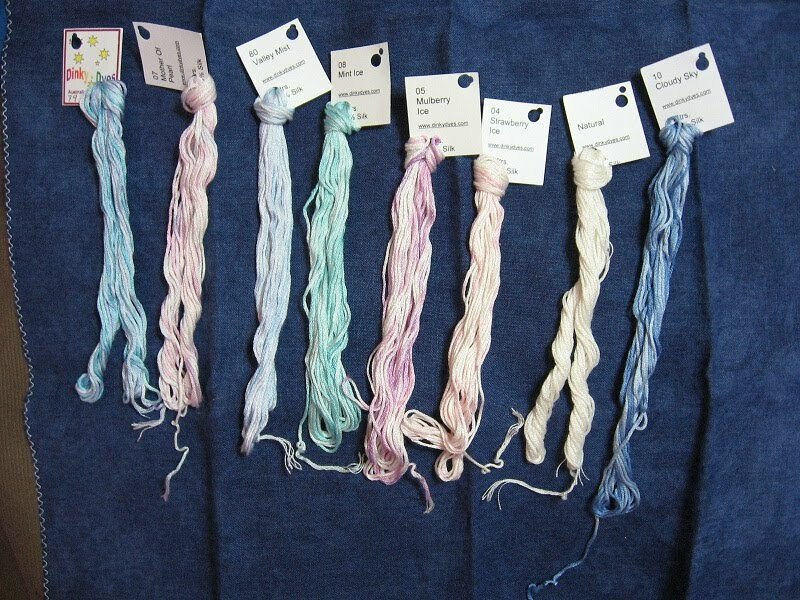 But when you're expecting a piece of linen and it turns out to be threads, it IS a little frustrating! Though frustrating in a good way if that's possible!! I checked the sent date, it took nine days to get here, so that means my fabric should be here Monday or Tuesday given that time frame. Sigh. So what do I stitch for the weekend? I've had a very productive couple of weeks, though no pics today as mom needed her camera for the weekend, and I shall try to borrow it back again when she gets home, lol. I finished up the beading on Sabrina last night after a nice visit to the LNS yesterday (which I will go into more detail about in a moment!) and I forgot to get the #4 Braid for the Petal Fairy! Doh. I'll have to make a note to get it next week. I also started and finished Bluebell - man did that stitch up quickly! It was like a really good book - I didn't want to stop stitching on it until it was done! It took a total of four days. I almost started Petal Fairy last night but hesitated because I was hoping to start AL today, which obviously isn't going to happen. So I might start that today. I worked on Turkish Delight for a couple days, but the 55 count, even though I can see it, gives me a bit of a headache after a while so I only work on it for short periods. That said, I'm getting through it pretty quickly. A couple more sessions and I'll be done! It's so cute and tiny!! I then pulled out English Whitework Sampler as it had been a while since it got any attention. I'm working on band 5 - still - it's a big one!! This one gives me headaches as well, though it's the white on white that does that I think. I can see everything just fine, but I also find it a bit tedious at times - eyelets and four-sided stitches galore!! It is pretty though. I got some more work done on the layout of Celtic Snow, the border is in and most of the central knotwork snowflake is in. Colours are chosen and I'll order them when I get closer to finishing the layout - I won't be stitching it until I finish AL. I did take a quick picture of them though! 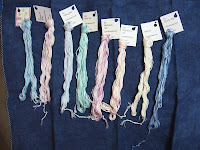 The fabric is Sassy's Nightfall, 40ct, and the threads are obviously Dinky Dyes! The Cloudy Sky is tentative, it's a bit darker than I had planned for a blue. I'm going to order in some of the new colour, Blue Ice, and see if that fits better. I was checking out some snowflake treasures - if they fit, I'll definitely have to add some, and I'm thinking some petite treasure braid as well. The effect I'm going for is moonlight glinting off the snow. The LNS visit yesterday was so much fun. I took all of my Sassy's Fabrics with me so that Brenda could see some of the colours in person before ordering. I say some of, I have about 25 colours here! And she already got a special order for one piece from a customer, so that's a bonus. We picked out some really lovely colours, and while choosing them I tried to think of designs to fit each one. I have to say, Sassy's Storm Clouds or Witches Brew would look absolutely awesome for Glendon Place's Sleepy Hollow, a pattern which is quickly growing on me and will probably end up on the to do list. And Honey Nut is fantastic for Prairie Moon's Red and the Black I and II. I'll have to check the dimensions and see if I have enough to do both. Though if memory serves, I think I only have the first one. And I'm still really itching to get Garden Fair, though I resisted temptation. I was a good girl and I only got Rosewood Manor's Past and Present this time. I'm also a little anxious (read pacing and nail-biting) waiting for a call back today about a possible job. Fingers crossed!! I wonder if I can bite my nails and stitch at the same time? Hope you get the job!